The Illinois River (Miami-Illinois language: Inoka Siipiiwi) is a principal tributary of the Mississippi River, approximately 273 miles (439 km) long, in the U.S. state of Illinois. The river drains a large section of central Illinois, with a drainage basin of 28,756.6 square miles (74,479 km2). The drainage basin extends into Wisconsin, Indiana, and a very small area of southwestern Michigan. This river was important among Native Americans and early French traders as the principal water route connecting the Great Lakes with the Mississippi. The French colonial settlements along the rivers formed the heart of the area known as the Illinois Country. After the construction of the Illinois and Michigan Canal and the Hennepin Canal in the 19th century, the role of the river as link between Lake Michigan and the Mississippi was extended into the era of modern industrial shipping. It now forms the basis for the Illinois Waterway. South of Peoria, the Illinois River goes by East Peoria and Creve Coeur, and then Pekin, Illinois, in Tazewell County, Illinois. It is then joined by the Mackinaw River and then passes through the Chautauqua National Wildlife Refuge. Across from Havana, the Illinois is joined by the Spoon River coming from Fulton County, Illinois, and across from Browning, it is joined by the Sangamon River, which passes through the state capital, Springfield, Illinois. The La Moine River flows into it approximately five miles (8 kilometers) southwest of Beardstown, which is south of Peoria and Pekin and north of Lincoln and Springfield. For the last 20 miles (32 km) of its course, the Illinois is separated from the Mississippi River by only about five miles, by a peninsula of land that makes up Calhoun County. The Illinois joins the Mississippi near Grafton, approximately 25 miles (40 km) northwest of downtown St. Louis and about 20 miles upstream from the confluence of the Missouri River and the Mississippi. South of Hennepin, the Illinois River is following the ancient channel of the Mississippi River. The Illinoian Stage, about 300,000 to 132,000 years ago, blocked the Mississippi near Rock Island, diverting it into its present channel. After the glacier melted, the Illinois River flowed into the ancient channel. The Hennepin Canal roughly follows the ancient channel of the Mississippi upstream of Rock Island. 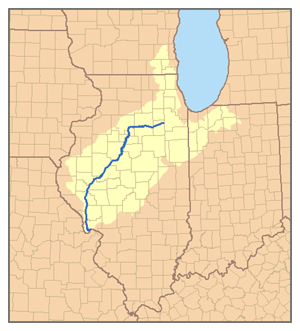 The modern channel of the Illinois River was shaped in a matter of days by the Kankakee Torrent. During the melting of the Wisconsin Glacier about 10,000 years ago, a lake formed in present-day Indiana, comparable to one of the modern Great Lakes. The lake formed behind the terminal moraine of a substage of that glacier. Melting ice to the north eventually raised the level of the lake so that it overflowed the moraine. The dam burst, and the entire volume of the lake was released in a very short time, perhaps a few days. Because of the manner of its formation, the Illinois River runs through a deep canyon with many rock formations. It has an "underutilized channel", one far larger than would be needed to contain any conceivable flow in modern times. Late October 2009 (before the flood). Early November 2009 (during the flood). The Illinois River as mapped in 1718, modern Illinois state highlighted. The Illinois River valley was one of the strongholds of the Illinois Confederation of Native Americans. The French first met the natives here in 1673. The first European settlement in the state of Illinois was the Jesuit mission founded in 1675 by Father Jacques Marquette on the banks of the Illinois across from Starved Rock at the Grand Village of the Illinois. Marquette wrote of the river, “We have seen nothing like this river that we enter, as regards its fertility of soil, its prairies and woods; its cattle, elk, deer, wildcats, bustards, swans, ducks, parroquets, and even beaver. There are many small lakes and rivers. That on which we sailed is wide, deep, and still, for 65 leagues." In 1680, René-Robert Cavelier, Sieur de La Salle built the first fort in Illinois, Ft. St. Louis, at Starved Rock. Later it was relocated to the present site of Creve Coeur, near Peoria, where the Jesuits relocated. The Peoria Riverfront Museum contains a gallery, "Illinois River Encounter," that attempts to interpret the museum through an aquarium tank and displays of the river's geology, ecology, social history, engineering, and commercial use. River tow leaving the Starved Rock Lock headed down river. From 1905 to 1915, more freshwater fish were harvested from the Illinois River than from any other river in the United States except for the Columbia River. The Illinois River was once a major source of mussels for the shell button industry. Overfishing, habitat loss from heavy siltation, and water pollution have eliminated most commercial fishing except for a small mussel harvest to provide shells to seed pearl oysters overseas. It is commercially fished downstream of the Rt. 89 bridge at Spring Valley. However, an infestation of invasive Asian Carp has crowded out many game fish in the river. The Illinois River is still an important sports fishing waterway with a good sauger fishery. The Illinois forms part of a modern waterway that connects the Great Lakes at Chicago to the Mississippi River. The waterway was originally established by the building of the Illinois and Michigan Canal that connected the Illinois River to the Chicago River. When the Sanitary District of Chicago later reversed the flow of the Chicago River, the pollution and sewage of the city of Chicago flowed down into the Illinois River. The Illinois and Michigan Canal has since been replaced by the Illinois Waterway, including the Chicago Sanitary and Ship Canal. River traffic and flood control is managed by eight locks and dams operated by the U.S. Army Corps of Engineers. As of 2011, all locks and dams on this waterway are closed to visitors for security reasons, except the Starved Rock Visitor Center, which offers an excellent interpretation of the entire system. The waterway is heavily used by barges transporting bulk goods such as grain and oil. It is used in the summer and early fall by tourists in pleasure boats cruising the Great Loop. The Illinois River is an important part of the Great Loop, the circumnavigation of Eastern North America by water. Aerial view looking west along the Illinois River, with Marseilles (bottom) and Ottawa (center frame). ^ "USGS Gage #05586100 on the Illinois River at Valley City, IL" (PDF). National Water Information System. U.S. Geological Survey. 1939–2012. Retrieved 2013-11-09. ^ "Of Time and the River". Illinois DNR. Archived from the original on 21 February 2015. ^ "Historic Illinois Intro". www.museum.state.il.us. Retrieved 2018-02-22. ^ "Illinois River Encounter". Peoria Riverfront Museum. Retrieved January 6, 2015. ^ "Clean River - Healthy Riverfront Program". City of Peoria. Archived from the original on 10 May 2009. Retrieved 28 December 2008. "River heals as lawsuit against Big Poultry looms - U.S. news - Environment - msnbc.com". MSN (AP). 20 September 2009. Retrieved 8 August 2010. "Illinois, a river of the United States" . The American Cyclopædia. 1879. The Chautauqua National Wildlife Refuge is located on the Illinois River in Mason County northeast of Havana, Illinois. It is managed by the U.S. Fish and Wildlife Service as one of the four Illinois River National Wildlife and Fish Refuges. The refuge consists of 4,388 acres (17.8 km²) of Illinois River bottomland, nearly all of it wetland. The parcel is the former Chautauqua Drainage and Levee District, a failed riverine polder. In the 1920s, workers with steam shovels surrounded the levee district with a large dike in an attempt to create a large new parcel of agricultural farmland. The levee district proved to be financially unable to maintain the dike, however, and the Illinois River reclaimed the polder. The complex alluvial topography that had existed before this intervention was replaced by the broad shallow pool of Chautauqua Lake. In 1936, the federal government acquired the 4,388-acre (17.8 km2) Chautauqua Drainage and Levee District parcel, including the dikes that enclosed the pool, and began to manage it for wildlife-refuge and flood control purposes. The flood-control aspects of this management have grown more challenging in the years since, as continued agricultural runoff and siltation of the Illinois River has made much of Chautauqua Lake shallower. On some shoreline strips of the lake, the silt has built up to the level of the lake surface, and an alluvial topography of sloughs and floodplain woodlands may be slowly re-establishing itself. However, many of the plant and animal species inhabiting the current Chautauqua Lake and Wildlife Refuge and adjacent Illinois River are nonnative and invasive species such as the Asian carp. As of 2005, of the 4,388 acres (17.8 km²) of the Chautauqua National Wildlife Refuge, 3,200 acres (12.9 km²) were classified as an open pool, 800 acres (3.2 km²) were classified as "water and timbered bottomland", and the remaining 388 acres (1.6 km²) were classified as upland forest. The closest numbered highway is U.S. Highway 136 in Mason County. A nesting pair of bald eagles was observed in the Chautauqua National Wildlife Refuge in the winter of 2005-06.The Cameron/Billsbach Unit is a detached section of the refuge located further north, in Marshall County, near Henry, Illinois. It covers an additional 1,079 acres (4.37 km²). Des Plaines Fish and Wildlife Area is an Illinois state park on 5,000 acres (2,023 ha) in Will County, Illinois, United States. It is located on floodplain adjacent to the confluence of the Des Plaines River (after which this park was named) and the Kankakee River to form the Illinois River. The Emiquon National Wildlife Refuge is a 11,122-acre (45.01 km2) wetland wildlife refuge located in Waterford Township in Fulton County, Illinois across the Illinois River from the town of Havana. Only 3,000 acres (12 km2) are currently owned by the U.S. Fish and Wildlife Service. It is in the Central forest-grasslands transition ecoregion. Most of the wildlife refuge is made up of reclaimed agricultural land. A 7,100-acre (29 km2) reclamation project within the Refuge, the Emiquon Project, is operated by the Nature Conservancy, which is a partner with the U.S. Fish and Wildlife Service in the creation of the Refuge.In February 2012, the Emiquon Complex, centering on the Emiquon NWR, was designated under the Ramsar Convention as a Wetland of International Importance. The Fox River is a 202-mile-long (325 km) tributary of the Illinois River, flowing from southeastern Wisconsin to Ottawa, Illinois in the United States. The Wisconsin section was known as the Pishtaka River in the 19th century. There are two other "Fox Rivers" in southern Illinois: the Fox River (Little Wabash tributary) and a smaller "Fox River" that joins the Wabash River near New Harmony, Indiana. Illinois River Forks State Park is a state park in the U.S. state of Oregon, administered by the Oregon Parks and Recreation Department. The park consists of approximately 400 acres, with 170 located between the forks of the Illinois River and the remainder on the west side. The portion between the forks of the river and accessed from Highway 199 just south of Cave Junction, is developed with paved parking, grass lawns with picnic tables, outhouses, and offers a wonderful swimming hole for summer users. The west side of the park, accessed from Westside Road, offers the West Side Trailhead and nearly seven miles of single-track, natural surface hiking and equestrian trails. There is gravelled parking for cars, and a separate pull-through parking lane area for horse rigs. A vault toilet and kiosk with the trail system displayed is in the parking area. Illinois has a variety of protected areas, including 123 state protected areas - state parks, wildlife areas, recreation areas, nature reserves, and state forests. There are also federal and local level protected areas in the state. These levels interact to provide a variety of recreation opportunities and conservation schemes, sometimes in a small area. For instance, 1,500-acre (6.1 km2) Shabbona Lake State Park lies in DeKalb County which has its own 1,000-acre (4.0 km2) forest preserve system, while the city of DeKalb has a 700-acre (2.8 km2) park system. There is one UNESCO World Heritage Site in Illinois, Cahokia. The Meredosia National Wildlife Refuge is a 5,255-acre (21.27 km2) national wildlife refuge located along the Illinois River in Cass County and Morgan County in the U.S. state of Illinois. The refuge is adjacent to Meredosia, Illinois, but is managed by the U.S. Fish and Wildlife Service from a headquarters located in Havana, Illinois. The Middle Fork of the Vermilion River is a tributary of the Vermilion River (Wabash River) in Illinois. The Middle Fork rises in Ford County and flows southeast to join the Vermilion near Danville.In its natural state, the Middle Fork drained a large upland marsh in what is now Ford County. The Middle Fork has been extended into the marsh by drainage ditches. Including the ditches, the Middle Fork is about 77 miles (124 km) long. Pere Marquette State Park is an 8,050-acre (3,260 ha) protected area in southwestern Jersey County, Illinois, United States. It is located near the city of Grafton, Illinois, at the confluence of the Mississippi River and the Illinois River. The park is located on Illinois Route 100, which at this location is also part of both the Great River Road and the Meeting of the Great Rivers Scenic Byway. The park is operated and maintained by the Illinois Department of Natural Resources, and is Illinois' largest state park in area. The park is also part of the Confluence Greenway and is at the northwestern end of the 21.5-mile (34.6 km) Sam Vadalabene Bike Trail. The Ray Norbut State Fish and Wildlife Area is a 1,140-acre (460 ha) state park located near Griggsville in Pike County, Illinois. It borders on the Illinois River and is primarily made of steeply sloped bluffland that is part of the river's valley. Heavily wooded, this region is managed for whitetail deer hunting. The Ray Norbut complex also includes Big Blue Island, a 100-acre (40 ha) riparian island in the Illinois River. The park is managed by the Illinois Department of Natural Resources (IDNR). The part in Madison County that locals consider part of the River Bend is the section north of Interstate 270 and west of Illinois Route 159. Sand Ridge State Forest is a conservation area located in the U.S. state of Illinois. Containing 7,200 acres (2,900 ha), it is the largest state forest in Illinois. It is located in northern Mason County. The nearest town is Manito, Illinois and the nearest numbered highway is U.S. Highway 136. It is located on a low bluff, or "sand ridge", overlooking the Illinois River, hence the name. The sand ridge is believed to be an artifact of the post-glacial Kankakee Torrent. The Sand Ridge State Forest largely dates back to 1939, when the state of Illinois purchased parcels of submarginal sandy farmland for conservation purposes. The Civilian Conservation Corps planted pine trees on much of the land. Today, the 7,200-acre (2,900 ha) state forest contains 3,916 acres (1,585 ha) of dryland oak-hickory woodlands, 2,492 acres (1,008 ha) of pine woodlands, and 792 acres (321 ha) of open fields and sand prairies. Endemic species include the prickly pear cactus, Opuntia, more familiar to Mexicans and residents of the U.S. Southwest. The Sand Ridge State Forest contains the Clear Lake Site, an archeological site listed on the National Register of Historic Places. Spring Lake State Fish and Wildlife Area is an Illinois state park on 2,032 acres (822 ha) in Tazewell County, Illinois, United States. The state park is centered on Spring Lake, an 8.5-mile (13.7 km) long alluvial lake that lies parallel to the Illinois River. The lakebed lies by the foot of the river's sandstone bluff in an abandoned bed of the river. It is a shallow lake that is no more than 10 feet (3.0 m) deep. The lake, located in the southwestern corner of Tazewell County, has been extensively altered by dikes built in the 1900s (decade) and the 1950s. The second dike system was built around both old Spring Lake and a second, smaller lake, Saiwell Lake, and caused the two lakes to almost merge into each other. The two lakes are now only separated by a spur dike, and both lakes are now called halves of modern Spring Lake. The nearest major town is Manito, Illinois. The Two Rivers National Wildlife Refuge is located on the Illinois River and the Mississippi River in parts of Calhoun, Jersey, and Greene counties in Illinois, and St. Charles County, Missouri. It is managed by the U.S. Fish and Wildlife Service as part of the Mark Twain National Wildlife Refuge Complex.As of 2009, the Two Rivers National Wildlife Refuge consists of five separate parcels of riverine bottomland wetlands grouped in and around the confluence of the Illinois and the Mississippi Rivers (hence the name, Two Rivers). The region is noted for its population of bald eagles.The refuge is 8,501 acres (34 square km) in size. Its headquarters is located in the Calhoun County municipality of Brussels, Illinois. Woodford State Fish and Wildlife Area is an Illinois state park on 2,900 acres (1,200 ha) of area Woodford County, Illinois, United States. Most of this protected area is over the Goose Lake and Upper Peoria Lake sections of the Illinois River.